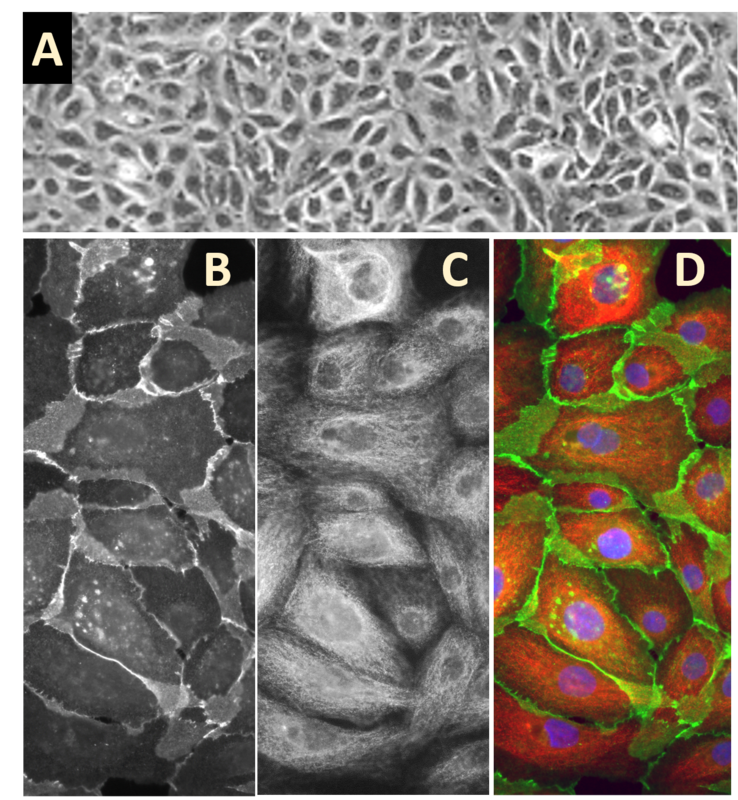 Human Mammary Epithelial Cells (HMEpC) provide an excellent model system to study many aspects of epithelial function and disease, particularly those related to cancerogenesis. (Click to Enlarge) Human Mammary Epithelial Cells (HMEPC) monolayer (A). HMEpC immunolabeled for e-cadherin (B and D, green) and for cytokeratin 18 (C and D, red). Nuclei are visualized with DAPI (D, blue). Fite, K., L. Elkhadragy, and J. Gomez-Cambronero. 2016. A Repertoire of MicroRNAs Regulates Cancer Cell Starvation by Targeting Phospholipase D in a Feedback Loop That Operates Maximally in Cancer Cells. Mol Cell Biol, 36:1078-1089. Pamarthy, S., L. Mao, G. Katara, S. Fleetwood, A. Kulshreshta, A. Gilman-Sachs and K. Beaman. 2016. The V-ATPase a2 isoform controls mammary gland development through Notch and TGF-β signaling. Cell Death & Dis, 7:e2443. Pampalona, J., E. Roscioli, W. Silkworth, B. Bowden, A. Genesca, L. Tussell and D. Cimini. 2016. Chromosome Bridges Maintain Kinetochore-Microtubule Attachment throughout Mitosis and Rarely Break during Anaphase. PLoS ONE 11(1):e0147420. Armstrong, M., M. Stang, Y. Liu, J. Yan, E. Pizzoferrato, & J. Yim. 2015. IRF-1 inhibits NF-κB activity, suppresses TRAF2 and cIAP1 and induces breast cancer cell specific growth inhibition. Cancer Biology & Therapy,DOI:10.1080/15384047.2015.1046646. Khalkhali-Ellis, Z., W. Goossens, N. Margaryan, and M. Hendrix. 2014. Cleavage of Histone 3 by Cathepsin D in the involuting mammary gland. PLoS ONE, July 23. Dutta, S., C. Warshall, C. Bandyopadhyay, D. Dutta and B., Chandran. 2014. Interactions between Exosomes from Breast Cancer Cells and Primary Mammary Epithelial Cells Leads to Generation of Reactive Oxygen Species Which Induce DNA Damage Response, Stabilization of p53 and Autophagy in Epithelial Cells. PLoS ONE, 9:e97580. Teoh-Fitzgerald M, M. Fitzgerald, W. Zhong, R. Askeland, and F. Domann. 2014. Epigenetic reprogramming governs EcSOD expression during human mammary epithelial cell differentiation, tumorigenesis and metastasis. Oncogene, 33:358-368. Sarkar, S., S. Rajput, A.K. Tripathi, and M. Mandal. 2013. Targeted therapy against EGFR and VEGFR using ZD6474 enhances the therapeutic potential of UV-B phototherapy in breast cancer cells. Molecular cancer. 12:122. Teoh-Fitzgerald, M., M. Fitzgerald, W. Zhong, R. Askeland, and F. Domann. 2013. Epigenetic reprogramming governs EcSOD expression during human mammary epithelial cell differentiation, tumorigenesis and metastasis. Oncogene.doi: 10.1038/onc.2012.582. Timpe, L.C., R. Yen, N.V. Haste, C. Litsakos-Cheung, T.-Y. Yen, and B.A. Macher. 2013. Systemic alteration of cell-surface and secreted glycoprotein expression in malignant breast cancer cell lines. Glycobiology. 23:1240-1249. Yen, T.-Y., S. Dutta, C. Litsakos-Cheung, A. Corona, L. Timpe, and B. Macher. 2013. Overcoming Challenges and Opening New Opportunities in Glycoproteomics. Biomolecules. 3:270-286. Hendrix, M., L. Postovit, R. Seftor, and E. Seftor. 2012. Methods of inhibiting tumor cell aggressiveness using the microenvironment of human embryonic stem cells. Patent US 8106004 B2. Kaur, H., S. Mao, Q. Li, M. Sameni, S.A. Krawetz, B.F. Sloane, and R.R. Mattingly. 2012. RNA-Seq of Human Breast Ductal Carcinoma In Situ Models Reveals Aldehyde Dehydrogenase Isoform 5A1 as a Novel Potential Target. PloS one. 7:e50249. Pampalona, J., C. Frías, A. Genescà, and L. Tusell. 2012. Progressive telomere dysfunction causes cytokinesis failure and leads to the accumulation of polyploid cells. PLoS genetics. 8:e1002679. Teoh-Fitzgerald, M.L.T., M.P. Fitzgerald, T.J. Jensen, B.W. Futscher, and F.E. Domann. 2012. Genetic and Epigenetic Inactivation of Extracellular Superoxide Dismutase Promotes an Invasive Phenotype in Human Lung Cancer by Disrupting ECM Homeostasis. Molecular Cancer Research. 10:40-51. Hendrix, M., L. Postovit, R. Seftor, and E. Seftor. 2011. Methods of inhibiting tumor cell aggressiveness using the microenvironment of human embryonic stem cells. Patent Application US 20130102541 A1. Yen, T.-Y., B.A. Macher, C.A. McDonald, C. Alleyne-Chin, and L.C. Timpe. 2011. Glycoprotein Profiles of Human Breast Cells Demonstrate a Clear Clustering of Normal/Benign versus Malignant Cell Lines and Basal versus Luminal Cell Lines. Journal of proteome research. 11:656-667. Hendrix, M., L. Postovit, R. Seftor, and E. Seftor. 2010. Methods of inhibiting tumor cell aggressiveness using the microenvironment of human embryonic stem cells. Patent Application US 20100273707 A1. Lloyd, S. 2010. An Analysis of Estrogen Metabolism and Breast Cancer Risk. PhD Dissertation, U Pittsburgh. Windhorst, S., R. Fliegert, C. Blechner, K. Möllmann, Z. Hosseini, T. Günther, M. Eiben, L. Chang, H. Lin, W. Fanick, U. Schumacher, B. Brandt and G. Mayr. 2010. Inositol 1,4,5-Trisphosphate 3-Kinase-A Is a New Cell Motility-promoting Protein That Increases the Metastatic Potential of Tumor Cells by Two Functional Activities. J Biol Chem, 285:5541-5554. Soler, D., J. Pampalona, L. Tusell, and A. Genescà. 2009. Radiation sensitivity increases with proliferation-associated telomere dysfunction in nontransformed human epithelial cells. Aging Cell. 8:414-425. Thibodeaux, C., X. Liu, G. Disbrow, Y. Zhang, J. Rone, B. Haddad, and R. Schlegel. 2009. Immortalization and transformation of human mammary epithelial cells by a tumor-derived Myc mutant. Breast Cancer Res Treat. 116:281-294. Bailey, C.M., D.E. Abbott, N.V. Margaryan, Z. Khalkhali-Ellis, and M.J.C. Hendrix. 2008. Interferon Regulatory Factor 6 Promotes Cell Cycle Arrest and Is Regulated by the Proteasome in a Cell Cycle-Dependent Manner. Mol. Cell. Biol. 28:2235-2243. Khalkhali-Ellis, Z., D.E. Abbott, C.M. Bailey, W. Goossens, N.V. Margaryan, S.L. Gluck, M. Reuveni, and M.J.C. Hendrix. 2008. IFN-γ regulation of vacuolar pH, cathepsin D processing and autophagy in mammary epithelial cells. J. Cell. Biochem. 105:208-218. Postovit, L.-M., N.V. Margaryan, E.A. Seftor, D.A. Kirschmann, A. Lipavsky, W.W. Wheaton, D.E. Abbott, R.E.B. Seftor, and M.J.C. Hendrix. 2008. Human embryonic stem cell microenvironment suppresses the tumorigenic phenotype of aggressive cancer cells. Proceedings of the National Academy of Sciences. 105:4329-4334. Tusell, L., D. Soler, M. Agostini, J. Pampalona, and A. Genescà. 2008. The number of dysfunctional telomeres in a cell: one amplifies; more than one translocate. Cytogenetic and Genome Research. 122:315-325. Khalkhali-Ellis, Z., and M.J.C. Hendrix. 2007. Elucidating the Function of Secreted Maspin: Inhibiting Cathepsin D–Mediated Matrix Degradation. Cancer research. 67:3535-3539. Wozniak, R., W. Klimecki, S. Lau, Y. Feinstein, and B. Futscher. 2007. 5-Aza-2'-deoxycytidine-mediated reductions in G9A histone methyltransferase and histone H3 K9 di-methylation levels are linked to tumor suppressor gene reactivation. Oncogene, 26:77-90. Ligresti, A., A.S. Moriello, K. Starowicz, I. Matias, S. Pisanti, L. De Petrocellis, C. Laezza, G. Portella, M. Bifulco, and V. Di Marzo. 2006. Antitumor activity of plant cannabinoids with emphasis on the effect of cannabidiol on human breast carcinoma. The Journal of pharmacology and experimental therapeutics. 318:1375-1387. Solomon, J.M., R. Pasupuleti, L. Xu, T. McDonagh, R. Curtis, P.S. DiStefano, and L.J. Huber. 2006. Inhibition of SIRT1 Catalytic Activity Increases p53 Acetylation but Does Not Alter Cell Survival following DNA Damage. Mol. Cell. Biol. 26:28-38.